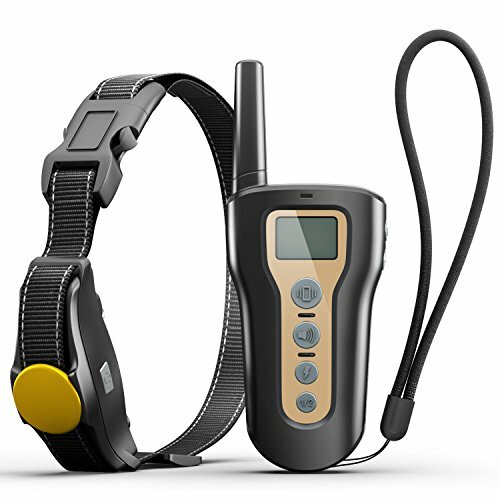 Personalize and Humanization-Basic beep and 8 vibration levels can solve most of bad behaviors such as biting, disrespect, and barking. The more advanced 16-layer static shock subdivides the previous 8-layer to minimize the damage to dogs and provide more options for users. IPX7 WATERPROOF SUPER WATERPROOF-- circumstances like rainy days or taking a bath perfectly work. But sometimes a long swim can cause damage to the receiver. FITS MOST DOGS-- Adjustable reflective nylon strap fits neck size from 8.5 to 25 inches, weight from 10-100LBS. You will not be disappointed with the size. Wall-through with long remote range- Sitting in a room or across a wall does not affect the receiver\'s signals. Especially, when the dog is in a disordered mood in the backyard, it allows you to control it remotely in a timely manner. Clearly LCD screen- Made of upgrade LCD backlight HD monitor，you can read the digitals very clearly under the strong sunlight with our big LCD screen.